Today is Thursday, January 12, the 12th day of 2017 in the Gregorian calendar, with 353 days remaining. 662 days until the 2018 midterm elections. On this date in 1959, Berry Gordy, Jr. founded Motown as Tamla Records with an $800 loan from his family and royalties earned writing for Jackie Wilson. The company was incorporated as Motown Record Corporation on April 14, 1960, in Detroit, Michigan. The name, a portmanteau of motor and town, has also become a nickname for Detroit. Motown played an important role in the racial integration of popular music as an African American-owned record label that achieved significant crossover success. In the 1960s, Motown and its subsidiary labels (including Tamla Motown, the brand used outside the US) were the most successful proponents of what came to be known as the Motown Sound, a style of soul music with a distinct pop influence. During the 1960s, Motown achieved spectacular success for a small record company: 79 records in the Top Ten of the Billboard Hot 100 record chart between 1960 and 1969. 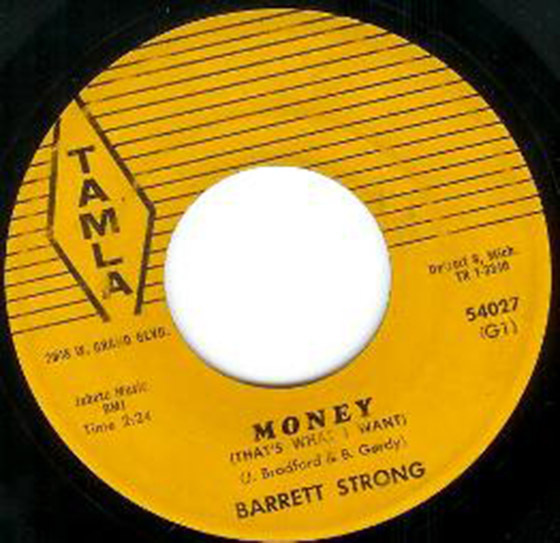 Its first hit was Barrett Strong's "Money (That's What I Want)" (1959), which made it to number 2 on the Billboard R&B charts (released nationally on Anna Records). Among other things, today is also International Kiss A Ginger Day. Kiss A Ginger Day was started in 2009 by Derek Forgie as a Facebook group intended as a “karmic counter-event” to the November 2008 creation of a Kick A Ginger campaign, also on Facebook. The latter resulted in numerous ginger kids being assaulted at school, stirring international outrage and condemnation. In response, Derek decided to dedicate January 12th to a much more peace-loving activity aimed towards gingers. Florida maid of honor arrested at wedding reception after getting drunk, nearly running over best man. As of this writing, The KGB Quotations Database contains 44,784 entries. Check it out. "A life can get knocked into a new orbit by a car crash, a lottery win or just a bleary-eyed consultant giving bad news in a calm voice." It's Jeff Bezos' birthday, but he seems to be giving out the presents... Amazon says it will create 100,000 full-time, full-benefit jobs in the US over the next 18 months. If you're like me, you rely on Google's Chrome browser auto-fill feature to complete forms online. Turns out there's a big problem with that. This was the opening to The Daily Show with Trevor Noah last night. Comedy Central didn't publish the opening as a separate video, and the one below, uploaded to YouTube, is formatted the way it is so that it can't be easily identified by software as a copyrighted work. The full Daily Show episode (including the opening) is here. Here's Digg's summary, so you don't need to go bouncing all over the web. While you were sleeping, GOP senators took the first step toward Obamacare repeal. Republican senators are now on record as having rejected opportunities to keep Medicare, Medicaid, and the children’s health program CHIP off the cutting-room floor; to make it possible to import prescription drugs from Canada; to prevent erosion of women’s health services and support for rural hospitals; and perhaps most tellingly, to protect Medicaid funding for the 32 states that accepted the option of expanding that program under the Affordable Care Act. The mess goes to the House on Friday. As the world looks on... Australian Business Review says Donald Trump media circus is damaging everyone. Baboons can make five human-like vowel sounds. That almost seems like enough to qualify them for political office. Tiny aluminium drum cooled beyond quantum limit proves we can make things even colder. Possibly down to absolute zero. This could make exotic things like large-scale quantum computers possible. Still late, but getting better. I'm improving... fortunately, most gastrointestinal bugs are self-limiting, which is good, considering my health insurance has lapsed. ACA keeps reminding me every day of the penalty I'll pay on my 2017 taxes if I don't have coverage... which equals about a half of one month's insurance premium. Not a strong hand from which to deal, fellas... and the Senate isn't helping you, either. I'm going to take tomorrow off and hope a full 24 hours in the sack will knock the rest of this out of me. Have a great weekend!